Above, an artist’s rendering of what a Russian Orthodox church Moscow wants to build in Paris would look like. And here I thought Orthodoxy had escaped the madness of modernist church architecture that caused so many hideous Catholic and Protestant churches to be built. But nyet. The good news is that French authorities are balking. The mayor of Paris has called the proposed design an eyesore. He’s right. This design is entirely inappropriate for Paris. Build an Orthodox cathedral, but make it look like an Orthodox cathedral, not a tacky airline terminal in a provincial Russian city. Posted in Christianity, France. Tagged Paris, Russia, Orthodox, cathedral, modernism. If you simply don’t put that stupid cover over the building and grounds, you will have a proper church. Paris needs to win this argument. That is hideous. What’s amazing is the little domes on top just enhance its eyesoreness. We Americans can’t complain about bad Orthodox architecture The great American architect Frank Lloyd Wright designed a Greek Orthodox Church in Wisconsin that is just hideous in my opinion. It was one of his last works. Looks like a flying saucer to me. It’s the roof that is the problem. Otherwise it would be a perfectly normal looking churchly building. But then the Milwaukee area has a Greek Orthodox church that looks like a UFO. It looks like one of the aliens from the 1994 movie The Puppet Masters. Yeah the roof is bad, and what’s with the wall around the church? Are those huge LCD screens? Ugh. I kind of like the softly glowing golden domes. On a more traditional structure, those might be a nice touch of modernity. Just hang a sign over the door that says (in French) “Museum of Modern Art” and all will be OK. It would be an eyesore in Paris, but in the suburbs it would be an aesthetic masterpiece compared to most of what’s out there. Well this is a can of localist worms! Who decides that? And what power do/should they have to enforce their decision? We talked about this with regard to St. Francisville. The folks who are there probably want to pull up the ladder to make it so the riff raff can’t invade. So they enact strict zoning codes to determine what’s appropriate for a given area. Etc. Etc. Etc. Anyway, I agree the design is ugly. And that Greek Orthodox church in Milwaukee was shaped like an Easter Egg. Its actually quite beautiful. It’s a meandering to the mosque side of the church-to-mosque architectural spectrum. An amusing pathetic-defiant statement. What’s weirder is that they’ve mostly also resisted this temptation (so far) in the new churches they’ve built in Russia. This looks like something Moscow mayor Luzkov would love though. Lose the blue napkin and street level Jumbotron and it’s not too bad. It isn’t just the outside of churches that are weird. When my wife’s aunt was funeraled (ok, it’s a neologism) the church was build around a circle with the pews around it on an incline, a sort of theater in the round meets Parchesi effect. And I could not help but think what would happen if my stepson’s 700 pound wife were to be there and lose her balance, rolling down the ramp like a boulder down a mountain, crushing the obviously gay priests and demolishing the altar. Can anyone explain/clarify the diocesan identities involved here? So, presumably this new church is to be a cathedral of the Moscow Patriarchate? Then of what archdiocese is the Alexander Nevsky Russian Orthodox Cathedral in Paris? Moscow? Russian Orthodox Church Abroad? Will an archbishop’s seat be moving from St. Alexander Nevsky to the new church, or are we talking about two different archdioceses? Is the new building both a cathedral and a museum? Sorry if these questions are obtuse, but I figure you’re always safe assuming that Orthodox hierarchical relationships are more complicated than you think. The blue napkin is why structural engineers want to strangle architects. What are they going to build it out of? I don’t see any structural support along the edges and keep imagining a good strong wind getting under it and sending the whole mess flying. The mural and the cross are quite beautiful. Well, it does represent modern Russia pretty well. Of course, the appropriateness of this building in Paris is a question of taste. After all, the city of Paris put up that hideous George Pompidou Centre (blech!!) so if the Parisians are going to wreck their city’s aesthetics with the Pompidou then the Orthodox monstrosity won’t be *that* out of place. When the Muslims take over Paris, they can snap the crosses off, put up a minaret, and call it The Flying Carpet Mosque. I like the Milwaukee church. The domes are quite striking. Mystical. The roof could even be interesting. I withhold harsh judgment until seeing it more clearly. The Byzantine church in Stuyvansant Square is quite striking too. It’s a very good example of mid-century modern. I’m quite fond of it. A number of mid-century modern churches are liturgically correct and follow rules of classical aesthetics even if they make use of steel and glass and modern techniques. They’re often full of rich marble and retain altar rails and such. It’s the American suburban churches from the 70’s and on that are truly wrecks on every level. A trend happening now is to make churches look traditional with veneers, but keeping the cheap post-modern structures — fake pillars and columns that are just for show, don’t support anything. No architectural integrity. This is NOT renewal. As for Ronchamp which you show in your article, I always wanted to go there. Corbu did this one. He was an atheist! Anyway, there are some elements to it that are oddly enough beautiful. OK, it is a monstosity but… still it’s an impressive. And I could not help but think what would happen if my stepson’s 700 pound wife were to be there and lose her balance, rolling down the ramp like a boulder down a mountain, crushing the obviously gay priests and demolishing the altar. Liturgically they are part of the tradition. But ecclesiastically they broke with that tradition when the King of Poland (or in some cases the Emperor of Austria) dragooned their forebearers into swearing fealty to the Pope. While I agree this particular church is ugly, surely it is not always necessary to produce carbon copies of existing churches? What about St Basil’s in Moscow? it was like nothing else in the Orthodox world when it was built, and yet it was acknowledged a masterpiece almost from the start. Yes, the “Orthodox in communion with Rome” angle. Which has always made absolutely zero sense to me, but which allows some Byzantine Catholics to believe that they can pick and choose which Catholic teachings they agree with and which they don’t agree with. But one simply cannot be an Orthodox Christian and also be in full communion with the Church of Rome, which also means agreeing with all of its teachings concerning the Papacy. This is one case where you cannot have your cake and eat it too. I was aghast when I discovered it was the OCA cathedral! My gosh, that is one ugly church. It’s uglier than the OCA cathedral in Philly, but not by much. The Philly church was built in 1974, and looks like 1974’s idea of the future. On the Boston cathedral’s site, there’s this informative but strikingly self-conscious history of the cathedral’s architecture, which more or less concedes that many people find the thing to be a monstrous carbuncle, but says HEY, it’s AN IMPORTANT MODERNIST BUILDING. BTW, James, my wife made your applesauce bread recipe the other day, and it was fantastic. So, thank you. I agree. They should build an Orthodox Church that looks like an Orthodox Church. 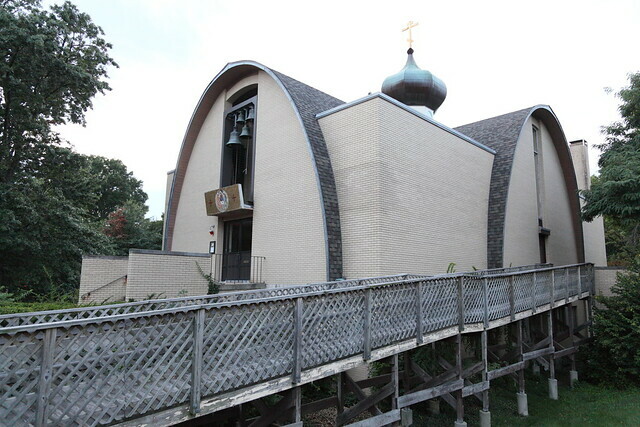 Here in America, the trend is towards more traditional Orthodox Church architecture and away from some of the awful modernist architecture of the past which look like Protestant or Catholic Churches. . We are now building traditional Byzantine Churches like St. George’s Cathedral in Wichita, Kansas. A beautiful traditional Russian style Church would be an addition to the architectural beauty of any area. Well, the Hagia Sophia was revolutionary in its day. In fact most Orthodox Churches prior to Sophia didn’t have the dome but where the basilica rectangle shaped. The first and 2nd Hagia Sophia were in the basilica shape but in Orthodoxy its hard to do something new like Sophia in the 6th century or the Union dome churches of Russia these days. Canonically Roman Catholic, practicing Greek Melkite Catholic here. Pope St. Gregory the Great, a saint in the Orthodox Church, had frighteningly latter-day papist views of his office. And, if I may reiterate, he is an Orthodox Saint. There was no schism in his time; that is to say, the Catholics were all Orthodox back then and the Orthodox were all Catholics. Ergo, it follows that someone can hold a fairly high view of the papal office and still be Orthodox.